This is an interesting film. On one hand I loved it and would highly recommend it. On the other, it's a film that covers a lot of dark subject matter that may not be appropriate for your children. I took my 6 and 8 year old daughters. It was too much for the 6 year old. She loved the dog and the fun moments, but there were some images and events that she did not want to see. She spent a good portion of the movie covering her eyes or her ears. The 8 year old was fascinated by the film and ended up asking a lot of questions about war. It opened up some good and healthy discussions with her. As for the movie, it is about as "G rated" as you can make a PG movie about war. There is no blood or death, nobody gets injured on screen, and there is essentially no hand-to-hand combat, even though some is implied. The soldiers on both sides do look scary in their gas masks, but the masks are introduced in a way as to try not to make them scary for kids watching the film, but to show that they are needed for saving lives. 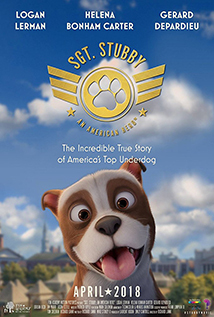 If you are looking for a funny, happy animated film this is not the movie for you or your family. It is a heartwarming, heroic tale, but it is a tale that happens in the middle of trench warfare. If your kids are younger you may want to check this one out first before you let them see it. If they are older, I recommend taking them and then talking through some of the deeper issues portrayed in this film.